Budget Tip: Time it right by visiting a National Park in the US on August 25th (National Park Service Birthday), September 28th (National Public Lands Day) or Veterans Day Weekend (November 9-11th), the parks won’t charge admission! Yellowstone National Park is the world’s first national park with 2.2 million acres of natural wonders and wild animals. Top sights include the Old Faithful, Yellowstone Lake, the Grand Prismatic Spring on the Lower Loop, Mammoth Hot Springs on the Upper Loop and Yellowstone Falls near the shared section of the two. At the southern edge of Yellowstone Park lies Grand Teton National Park, which boasts majestic views of the jagged peaks of the Teton Ranges and miles of hiking and wildlife watching by Snake River. Located at the gateway to Grand Teton National Park and a short one hour drive to the southern entrance to Yellowstone National Park, the LEED-Silver Certified and AAA Four Diamond luxury Hotel Terra Jackson Hole’s has a special “Passport to the Parks” package that offers three nights lodging, a seven-day park pass and more. The AAA Four Diamond Teton Mountain Lodge & Spa is also steps from the entrance to Wyoming’s Grand Teton National Park and one hour south of Yellowstone. Their “National Park Explorer” package includes a $50 gas voucher and daily breakfast credit for a three-night stay, as well as a seven-day park pass. 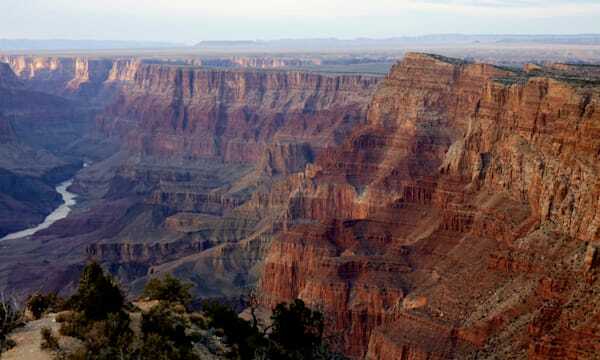 The Grand Canyon is 277 miles long, up to 18 miles wide and has a depth of over a mile. Known for its visually overwhelming size and intricate and colorful landscape, the Grand Canyon boasts some of the world’s most jaw-dropping and dynamic views. Situated just 45 minutes south of The Grand Canyon in Sedona, Arizona, this luxurious hotel offers a special package that helps guide travelers to and from the canyon named one of the Seven Natural Wonders of the World. The two-night package offers a day-long tour and breakfast credit. Divided into two sections, called districts, Saguaro National Park is 91,442 acres, 70,905 acres of which are designated wilderness. The park gets its name from the saguaro, a large cactus, which is native to the region. Close by is the Coronado National Forest, which is spread throughout mountain ranges in southeastern Arizona and southwestern New Mexico. Divided into five ranger districts, each consist of multiple “ski island” mountain ranges. Tanque Verde translates as the “green pool,” a name given by the Pima Native Americans due to the seasonal river that runs through the land to create a mountainous desert oasis of vibrant cacti and various unique plants. All-inclusive rates mean that three meals daily are covered, and the resort offers a number of activities, including guided hikes, biking and horseback riding. Spanning 2,564 square miles of valleys, mountains, glaciers, forests, meadows and rivers, Banff National Park is one of the world’s premier destination spots and one of the most visited national parks in the world. Nestled in Canada’s first national park and the world’s third, the Fairmont Banff Springs, a UNESCO World Heritage Site, was built in 1888 as a Canadian Pacific Railway (CPR) hotel. This 200,000-acre park is haven to deer and songbirds and is an ideal location for outdoor activities for the whole family. It’s also an easy drive from major cities like Washington, D.C., and Richmond. If we were planning a day trip, we’d do the challenging yet manageable hike called “Old Rag” along Skyline Drive and take a pre- or post-trip visit to nearby Charlottesville. Salamander Resort & Spa is set to open this August in the heart of Virginia wine and horse country in the quaint 18th-century village of Middleburg and a short two-hour scenic drive along Virginia’s Skyline Drive to Shenandoah National Park. Set on 340 acres of farmland, the brand new resort offers a culinary program led by Chef Todd Gray of Equinox Restaurant in D.C., including two restaurants, a wine bar, a cooking studio and a two-acre culinary garden; a world-class spa with 14 treatment rooms and an onsite equestrian program to rival any other in the world.